"Presenting addresses to Sir Wilfred Laurier at Prince Rupert." 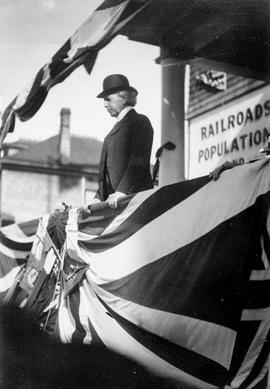 Prime MInister Sir Wilfred Laurier visiting Prince Rupert. 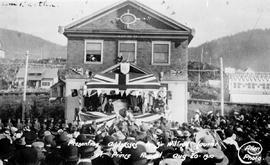 Prince Rupert City Hall; The Visit Of Sir Wilfrid Laurier. Sir Richard McBride opening the government wharf at Prince Rupert. The arrival of Sir Richard McBride at the new government wharf in Prince Rupert. The first motor car in Prince Rupert; the Honourable Premier T. D. Pattullo at the wheel.